Simply put, this was a wonderful space to be in and photograph. It provides a good example of architecture, lighting and photography working together to achieve the same goal, definition of space. Whilst it is the surfaces that are visible, it is the atmosphere that needs to be seen and felt within the images. From the vast to the intimate, whilst the camera never moves it seems to photograph a different space in each of the images. The modernist church at Worth Abbey in West Sussex has a busy and varied schedule. Recently refurbished by a design team led by Heatherwick Studio and supported by DPA Lighting, Francis Pollen’s Grade II* listed building has to cater for many uses at all times of day and night. The improved lighting was crucial to the success of the project and the monks had requested a flexible control system that catered for their diverse needs. ‘Invisible’ but multi layered, the lighting design allows the mood of the space to be completely and dramatically transformed according to the time of year, the time of day, the number of people present and the requirements of each individual service. 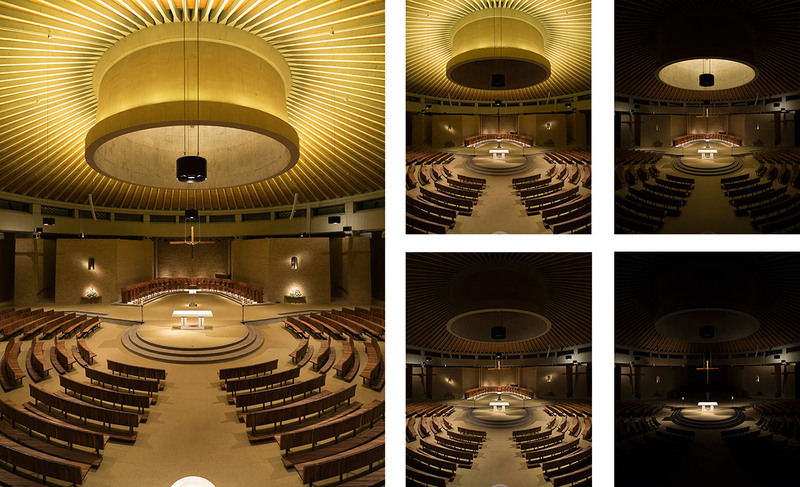 From the 900 strong congregation on Christmas morning to the lone monk at midnight, the space changes in use, mood and appearance and it is this that the photographs needed to capture.